7 September– remembering Rollin “Oscar” Sullivan (July 19, 1919 – Sept. 7, 2012), singer/mandolinist who starred with brother Johnny Sullivan as hillbilly comedy Lonzo and Oscar for 38 years, scoring a big hit in 1948 with “I’m My Own Grandpa”. 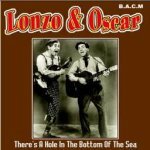 Earlier, Rollin had played mandolin with Paul Howard’s Arkansas Cotton Pickers but it was whilst playing in Eddy Arnold’s band in the mid ’40s that they honed their country comedy act and became ‘Lonzo & Oscar’. Both talented musicians, they left a great legacy of music and humor.